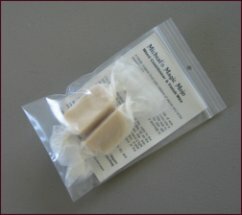 A totally organic food safe mixture of waxes and oil for wood turning. Use for end grain applications, hold the cube of wax on the turning wood at the end grain before you use a gouge or scraper on the end grain. Allow the wax to soften and absorb into the end grain. The wax will help to support the wood fibers as you cut and help to make a smooth even cut. For finish applications, lightly touch the cube to the turning wood. Let the wax heat up a little bit as the wood turns against the cube, spread the wax uniformly over the turned wood. After you have a light coating of wax, use a pad of soft cotton (t-shirt material) to heat up and polish the surface of the wood. For a higher gloss, wait a bit for the wax to dry and harden, then buff to the desired gloss. Always be careful not to get your hand or fingers caught in the polishing rag or anything touching the turning wood! Safety First! 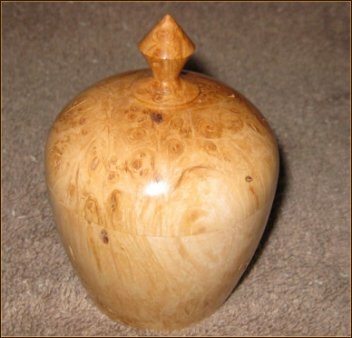 I discovered this combination of waxes and oils after an afternoon working with a really nice piece of walnut on the lathe. It had fantastic grain and a nice look for a medium sized bowl. As I worked it I noticed that no matter how many times I sharpened my gouge I was getting quite a bit of tear out on the end grain sides of the turning. I stopped and did a bit of research on the internet and by looking through some of my magazines. 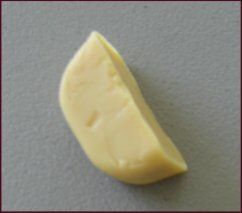 A couple of articles suggested using some beeswax before turning. I tried it and it worked. Then I decided to try mixing some finish oils and a couple of finish waxes with the combination. I knew I would be using the bowl for nuts so I wanted to make sure the mixture was food safe. This made me consider only food safe waxes and oils. After a bit of trial and error, here is my winning combination, Mixed in my wife's old crockpot and poured into some ready to use molds I found. I hope you get as much joy out of using this finish as I do.